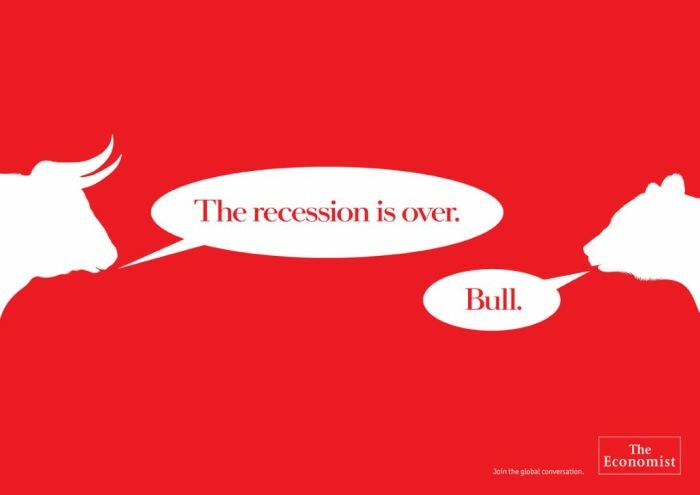 Award-winning advertising campaign (2009) for The Economist by Memac Ogilvy (Dubai, UAE). It might not feel like it, but you’ve got to trust me on this because the statistics say it’s true. We’re out of recession! Who knew? The recession is, technically, over. South Africa’s third-quarter GDP grew by 2.2% quarter on quarter. Agriculture (up 6.5%) and manufacturing (up 7.5%) did particularly well. Mining, however, is down 8.8%. The Money Show’s Bruce Whitfield interviewed Dr Adrian Saville, CEO of Cannon Asset Managers and Professor at Gordon Institute of Business Science (Gibs).